First time cruisers often wonder what they will do on Sea Days. Many experienced cruisers actually prefer sea days. They know what is in store. 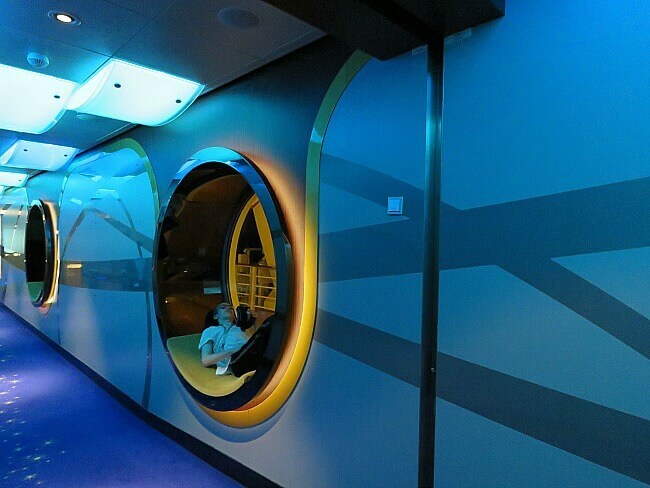 Cruise lines go all out to keep passengers entertained on days at sea. Here are the Top 10 Reasons Why Cruise Sea Days are Wonderful. Always check your cruises daily planner for a schedule of activities. On sea days, your cruise director and staff work hard to keep you entertained. Compete against fellow travelers in trivia: music, movies, pop culture, pirates, history, and more. You might be selected to participate in the cruise versions of Family Feud or Newlywed Game. If not selected, then it is still fun to watch. Days in port tend to be very busy. You get up early. Breakfast at the buffet is rushed. Then, you hurry onshore for a port adventure or to explore on your own. On sea days, it is just the opposite. There is no rush. You can do as much or as little as you wish. Sleep in. Lounge by the pool or on the promenade deck. You can sneak in a nap if you wish. For many people, no cruise would be complete without a spa day. Enjoy a massage. Get a skin treatment. Bake in a steam room or sauna. Just relax and let the attendants take care of you. Many cruise lines play first run movies in their theaters on seas days. We tend to not go to movies at home prior to our cruises. During the cruise, we can catch the latest films in a relaxed atmosphere at no extra cost. It is a great way to escape the heat of the pool deck. Or, if it is raining or cool outside, a movie is perfect, too. On sea days, you need to have lunch at one of the table service restaurants. Buffets are good, to a point. Some of our best dining on cruises, though, has been at lunch. Compared to dinner, the restaurant will be quieter, more peaceful, and less crowded. You will enjoy a four to five course lunch in addition to the traditional dinner. Splendid! The food is generally lighter. So, it’s okay. On sea days, your cruise will usually offer daytime entertainment in addition to the evening show. Whether it is a magician, comedian, singer, or ventriloquist, you will be entertained. 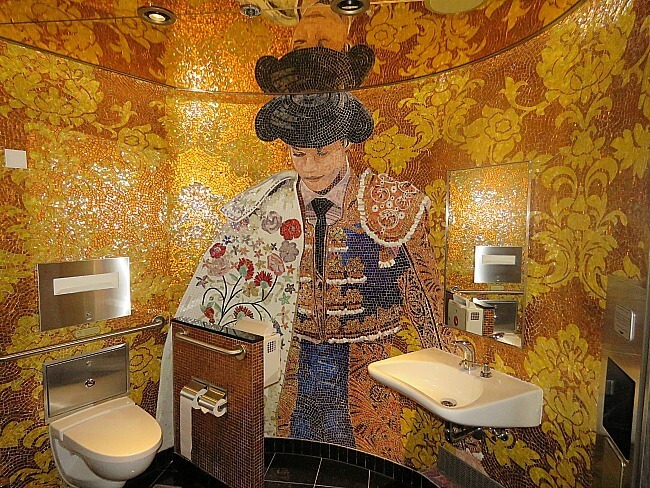 Spanish inspired rest room in the Europa entertainment area. Wow! Sea days provide the perfect opportunity to explore your ship. Many offer open houses of the child and teen areas. Even if you do not frequent the bars, it can be fun to wander through them. Oftentimes, there will be formal tours to help guide you. You will be amazed at how much they have packed onboard. With all of the food and drinks constantly available on cruises, it can be hard to squeeze in time to exercise. On sea days, you have plenty of time. Jog or walk around the promenade deck. Take some time to go to the fitness room with stationary bikes, treadmills, ellipticals, and weights. Many cruises offer pilates, yoga, tai chi, and other fitness classes. I know many people who love cruise ship casinos. If y0u enjoy gaming, then sea days are a perfect opportunity. Disney cruises do not have casinos, but they do have BINGO. People literally flock to the BINGO games. I have heard of jackpots over $10,000. When was the last time that you played basketball, putt putt, foosball, or ping pong with your family? Some ships have driving ranges and bocci ball. There are now larger ships with bowling alleys and even ice skating rinks. Wow! 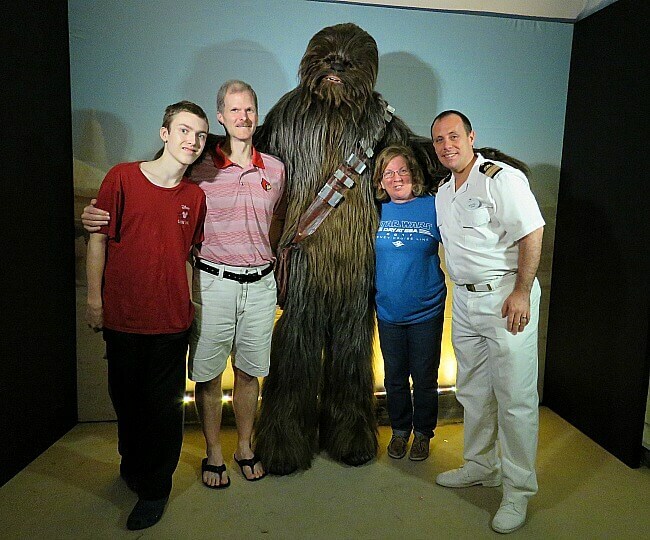 Roly, me, our friend Patricia, and assistant cruise director Micheal with Chewbacca. We have met wonderful people from around the U.S., Canada, and the world on our cruises. If there are certain activities that you enjoy, you will likely interact with the same crew members and guests many times. It is a great way to make new friends. So don’t shy away from cruises with multiple sea days. You will still be entertained and may find that you really like them more. That transAtlantic looks quite enticing! I’m definitely going to book a massage for my sea day. I am hoping they have a good workout schedule too. I would love to do some yoga while traveling. 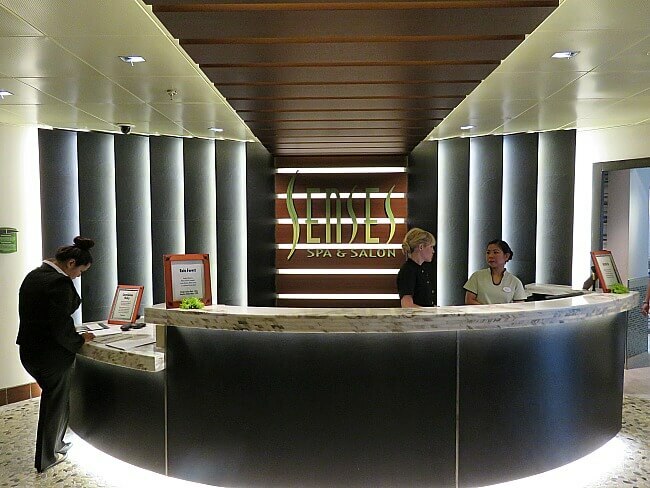 The cruises that we have taken each had wonderful spas. I know fitness classes including yoga were offered, but I run each morning have not investigated. There was a young lady performing yoga each morning on the promenade deck as I ran each morning, though. I hope you have a great cruise. Great suggestions. Our last cruise didn’t have any days at sea. It seems like it would be nice to have a day just to chill out and relax. If I was on a big ship I’d definitely take a tour. That sounds fun. Great Chewy pic! I prefer cruises that have a mix of port and sea days. I love seeing things, but I also love relaxing and playing on board. Chewy is from Disney’s Star Wars Day at Sea. I admit I am one of those who prefer port days but sea days are needed to recover. On my last cruise, I had a fantastic day at sea. There was so much to do. Our day flew. And, yes, we ate pretty well. 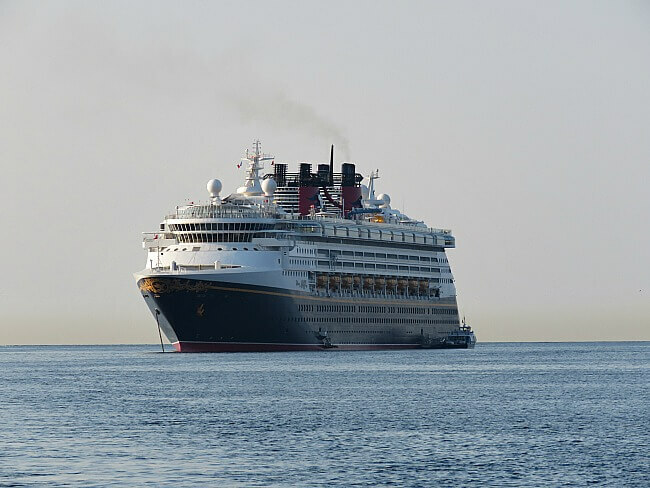 Disney is our cruise line of choice; so, that probably affects our impression. This post brings back great memories I have of crossing the Indian Ocean on the Crystal Symphony. We had two four-day stints at sea, and to keep us all entertained the entertainment director put on an “olympics.” Many of the activities on the ship had tournaments, with the winners representing their country on the podium at an end-of-cruise awards ceremony! Crossing the Indian Ocean sounds amazing. 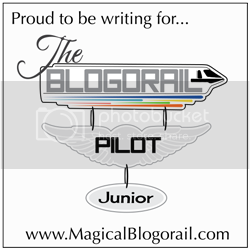 We are hoping to do a trans-Atlantic in the next couple of years. We love the onboard games and schedule our sea days around them. Cruises are definitely NOT boring during sea days! Can’t say I’m an experienced cruise-er by any means (only been on one), but the amount of activities they have (not to mention some may have food available all day and a pool) is fantastic! I haven’t been on a cruise yet, but I’ve heard lots of good things. You’ve certainly made a strong case for days on the cruise ship. The restroom is amazing, and I’d be totally into a photo with Chewy. We are obviously completely sold on cruising. “Meeting” Chewy and Darth Vader was pretty neat. I have never taken a cruise, but this does sound like a good idea to have a day mixed in where you can take it easy and actually relax! I’d definitely head straight for the spa :-). My father-in-law did a cruise last year which involved seven straight days at sea – a few too many for me I think! We are hoping to do a trans-Atlantic within the next couple of years. If we get to do it, we will definitely cruise with Disney. It would not get boring. We’ve still never done a big cruise but wow there is so much to do isn’t there? I could see how a cruise day would be the perfect time to kick back and try out all the activities. I would definitely be heading to the spa first. Trivia is our favorite, too. Even the rest room was an attraction in itself. 🙂 I would love to try cruising some day, too. I’ll keep the sea days in mind. That is the most attractive rest room that I have ever seen! This does look like a good way to spend sea days. The food alone would be worth it. It doesn’t seem boring at all- I would love to spend days like this. 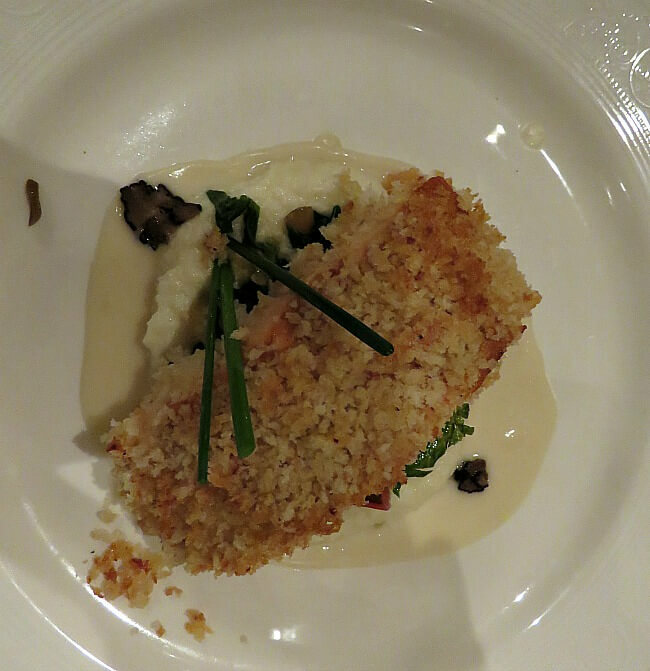 We are not foodies, but we love cruise line dining. Oh. i think this type of trip is not for me, but if be a rich man then must took this taste. We are certainly not rich by American standards, but I understand. To visit a lot of places, cruises are cheaper than staying on land, especially Europe and much of the Far East.